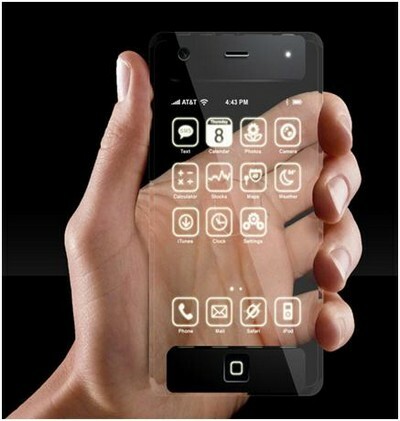 Using screen-developing technology, a Taiwanese company announced the prototype device made of transparent glass. Technology keeps on assuming new dimensions, and smartphones are witnessing most of it. First came a calling mobile phone, then the one with most advanced features like iphone 4s and now an invisible one. Polytron technology company has just released a phone line, almost invisible to the human eye, with the small circuit that is hard to see. Accordingly, the IC system of the phone is made from ultra-thin wires that are inserted between two layers of glass, according to The Register. Polytron is a company specializing in display technology, and marketing products such as "separate the glass". The liquid crystal molecules on the surface of the glass are randomly arranged when the power is down, but when the current is connected, they align and allow light to pass through. As a result, this smartphone looks invisible until it is turned on. According to Polytron, some mobile carriers are showing interest in this new technology. The invisible Smartphones are still in the early stages of development. They have not been able to inculcate add-ons such as the SIM card and battery like in past. And following the demo clip on that page of Mobile Geeks, it seems that it is not run by the operating system. However, the outlook is very promising. This Guest Post was written by Gaurav Jaggi, the blogger at TECHRAZR, the latest technology news blog. 0 Respones to "The “Invisible Phone” – Giving New Dimensions to Technology"